Not sure how well it would do with that one skinny tire! I would love to find it and give it a try. "Not sure how well it would do with that one skinny tire!" Very nice. I see the acetylene light and tank. What a thrill it would be to run, day or night. I believe it has a tire chain on it. Look to the lower left of the tire. To me, it appears to have two visible chains and what appears to be another one on the bottom, spaced about right. "David - spell check - it's "Australia" .........."
Darn photoshop does not have spell check.....Thanks for the correction. The two Harleys with sidecars look like they would be the most usefull. 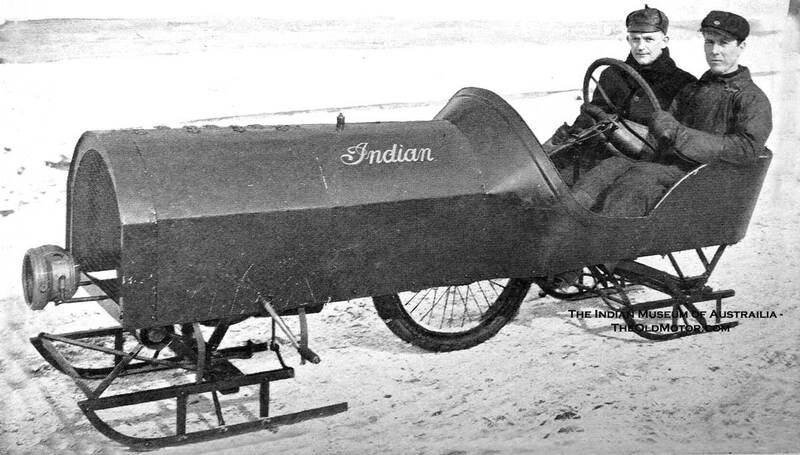 I have never seen anything like the first picture of the Indian speedster, must have been very few made. Is that a kick-start crank? I think that guy is just spinning his wheels. I rode a Ural rig for 9 winters. Better than a car! "I think that guy is just spinning his wheels"
If you look close you can see that it is wearing a tire chain.